Who am I when I am not Pippi? What is it like to be the slowest, injured and least energetic of the group? What is it like to ask for help? 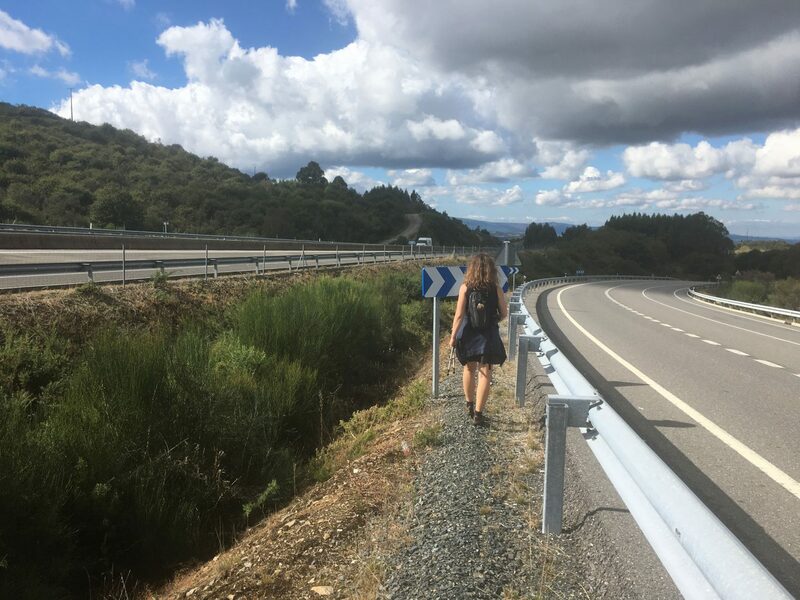 I learnt all this on the Camino Sanabrés – just like I enjoyed all the beautiful experiences waiting around every corner, when I accepted my heel injury and the work that needed to be done – just as it was. We are back to where we stopped on Camino Sanabrés three months ago due to a heel injury. Or more precisely this time we start 5 days and one autumn further down the route. We start off at Ourense. 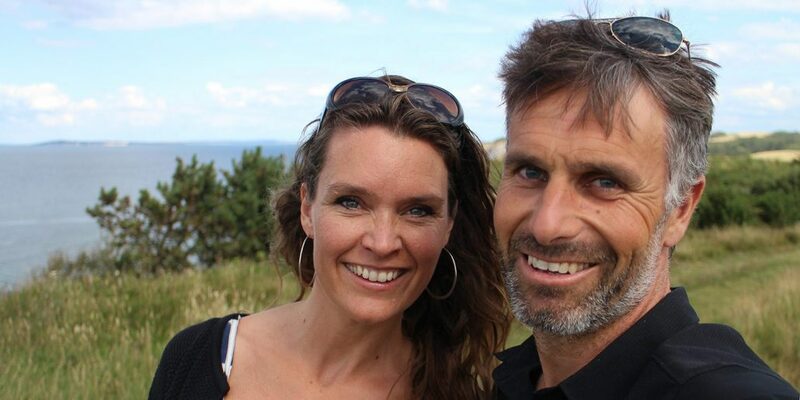 My husband Torben and I feel truly lucky to be here with a daughter each. 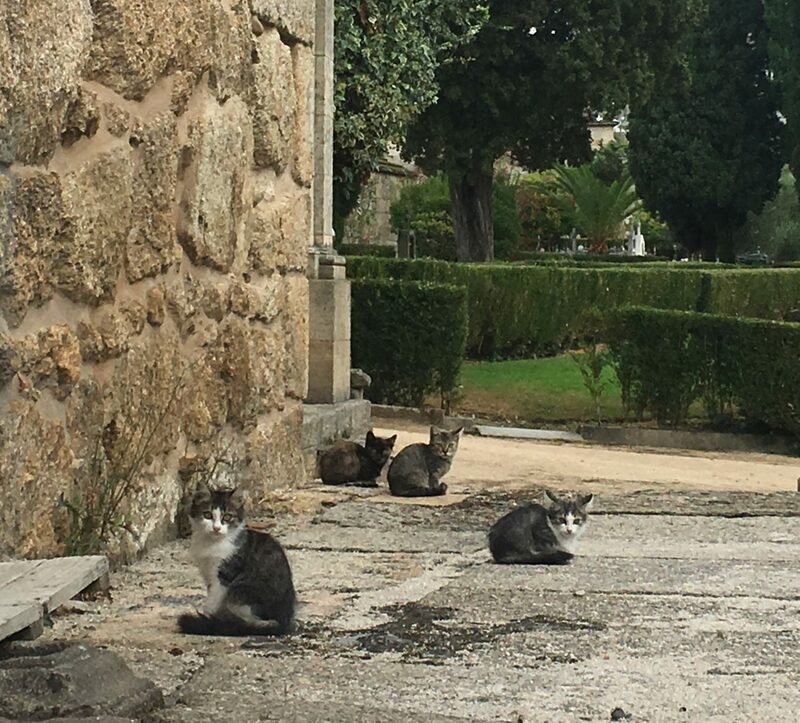 The first we meet are 4 cute kittens at the municipal albergue in Ourense. They are curious and look intensely at us. Our thoughts fly off to the rest of our family, our remaining 4 children back home. After a while the kittens forget all about us and continue their playful day and we are free to go… From the beginning we clearly have to adapt to different roles and forms. 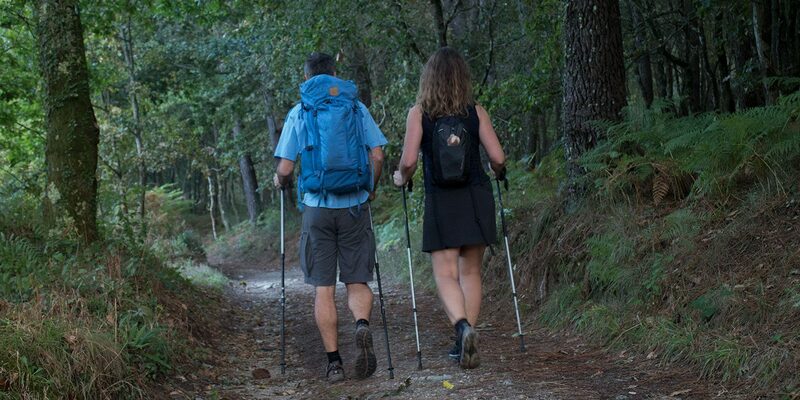 On this camino we are not only woman and man, we are also mother and father. Quietly, we settle into our parental roles: deciphering the girls, setting the day up in a way that will allow everything to run smoothly. Showing leadership and showing them the way. But that is not what we need to do here! It’s actually the opposite. We need to let them walk alone, find their way themselves, handle their mood swings and the unknowns and troubles of the day. It’s not that I can’t see with my eyes that they have become young women, it is my heart that doesn’t understand it yet. They look back too. 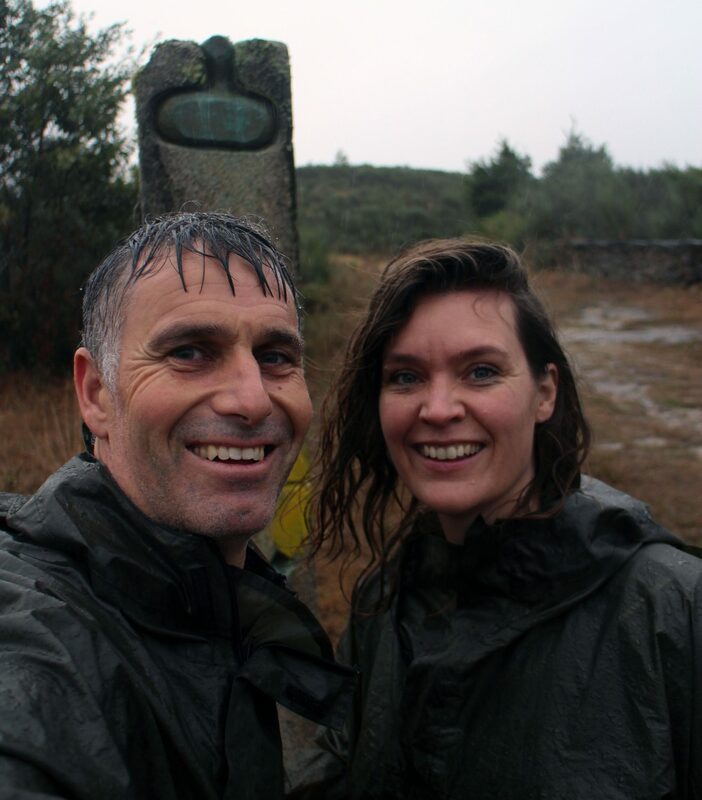 Like after a morning of pouring rain and an incline unlike any other just outside Ourense. The girls walk up front. Suddenly they reach a house and turn back toward us. They look at us with questioning eyes and when we reach them, we meet a full-bearded man with an authentic cave behind him, spider webs and memories in every corner. They walk inside steadily with us right behind them. We are sat down on a bench by two workers from the sawing mill. My feet are drenched to the point that they splash water when I move my toes. I am so much more grateful and happy when our friend serves up a flaming hot cabbage soup, warm coffee and French toast. His name is César – NOT Julius Cesar, as he is Celtic .. NOT Roman! While pouring wine for himself and his employees out one sleeve, he pours pilgrim stories out the other. I eat the soup and his stories fully while I thank my lucky stars for all the Spanish I have learnt during the past month while driving from place to place in Denmark. It is wonderful to understand what is being said. I missed out on a lot before. I thought we were the experienced pilgrims who understood the principles of a pilgrim and the hurdles that would come and what to expect. But then again it turns out we weren’t. 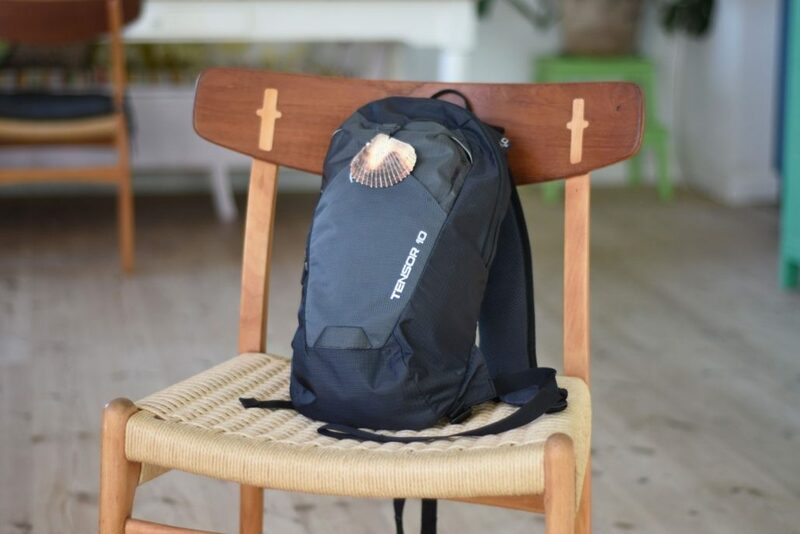 For the first time during a camino I am having by backpack transported with mochila taxi and walking only with a light day backpack. The only reason for this is to care for my plantar fasciitis heel injury. Mochila taxi is great concept – but I am out of my comfort zone. At dusk I left my backpack in the kitchen of a bar in Ourense with a note with my name and my destination. The Spanish mail Correos promises to transport backpacks to the next destination for 4 EUROs, with delivery at 2.30 PM at the latest. However, when we get to our destination at 4PM, my backpack is nowhere to be found. There is a message left for me saying I will get the backpack the next day. Correos had tried to contact me by mail because they couldn’t find my backpack. But checking my mail had – fortunately – not crossed my mind during the camino. That afternoon I am like an upset irrational moody teenager: I want dry clothes. I want a bath, I want security. I want all that is well-known… Again I appreciate my Spanish skills, because I can now understand that it was Correos that made the mistake. They had looked for my backpack at Bar Acapulco, not Bar Alameda, as agreed. When they realize their mistake, the service is top-notch: they drive out an extra time and at 5 PM I have my warm bath and dry clothes. My word for and my experience with mochila taxi so far is “Freedom”. Freedom is what I love about walking. The feeling that everything I need is in my backpack. 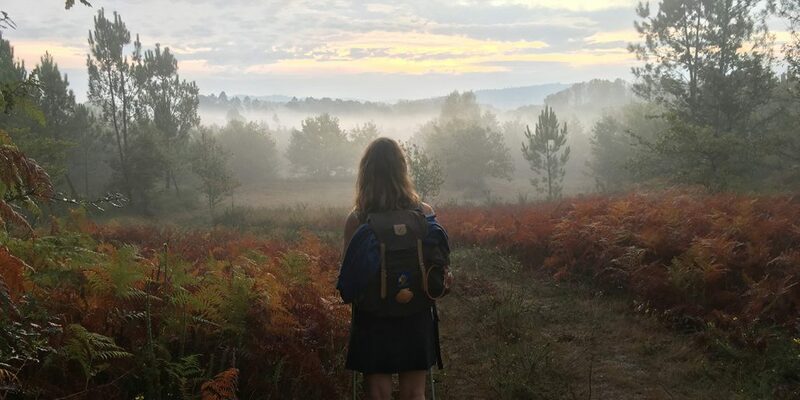 Of course some of this freedom is lost when you have to get to the agreed destination, but a camino is not be about being “a real pilgrim” who carries her own backpack. 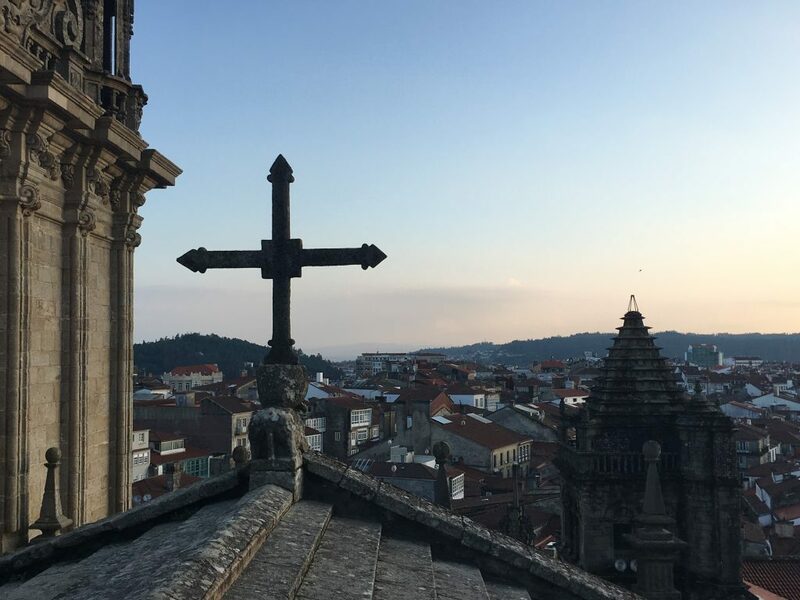 It is about freedom… and this time, the camino for me is to learn to accept the circumstances, conditions and limitations of my life, when necessary. And it is so now, for me. 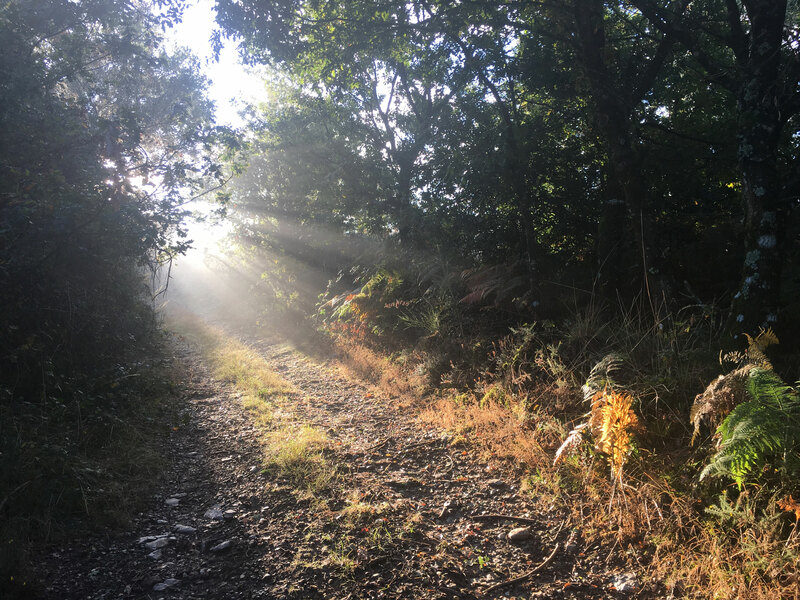 Fortunately, the camino brings this forward slowly, in its own quiet magical way – backpack or not – and for this I am grateful. The day starts out calmly as we lay in the hotel room listening to the church bells ring. Actually… no… we can’t hear them because we are talking non-stop. There is good coffee brewing in the common room and Torben has already brought us some, filling our depleted tanks. We do what we always do: work through and contemplate the day gone by. Today it gets clear that we are a group walking together. Four is many. Each with their own body, viewpoints, moods. I know exactly who I am – no question about that. I am the introvert kind. I may talk (and write!) a lot but it is very rarely clear to anyone but myself, what really goes on behind the scenes inside me. We have left everything behind at home – except for our communication patterns. 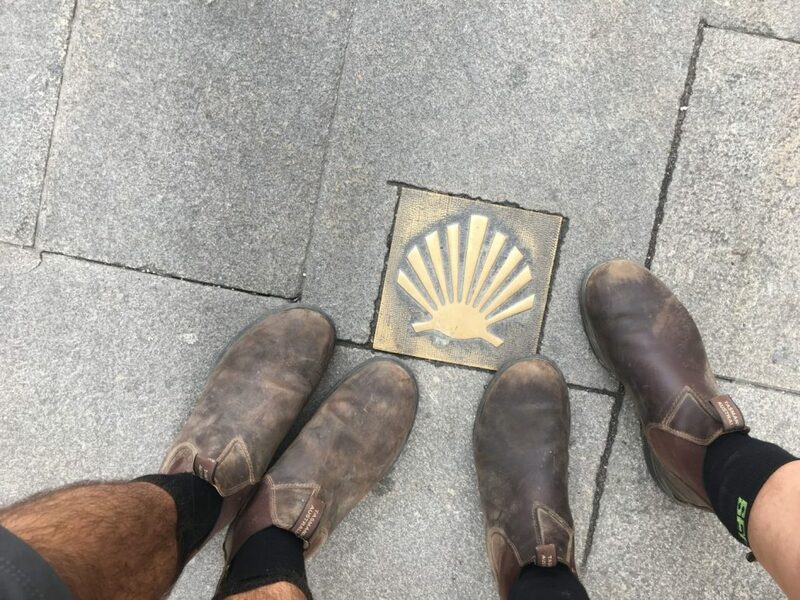 We are who we are – during this camino too. My inner voice wants to keep the group together. 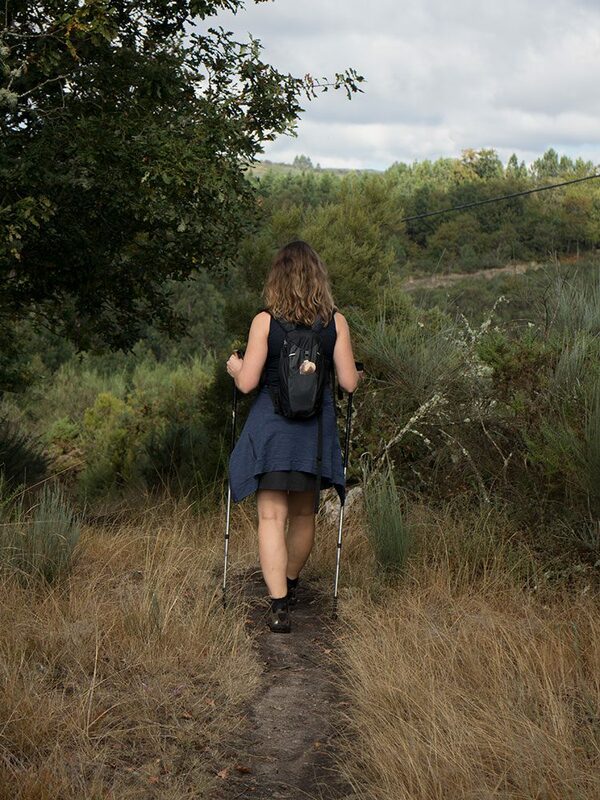 This takes precedence over how I really want to walk the camino, including my heel and the mental challenges that keep me lagging behind deeply engrossed in my own thoughts, sensing my surroundings and taking pictures. I look forward and watch my husband walking with our daughters – I only watch and I get to see how he really does it – with song, jokes, playfully teasing, and keeping them together. 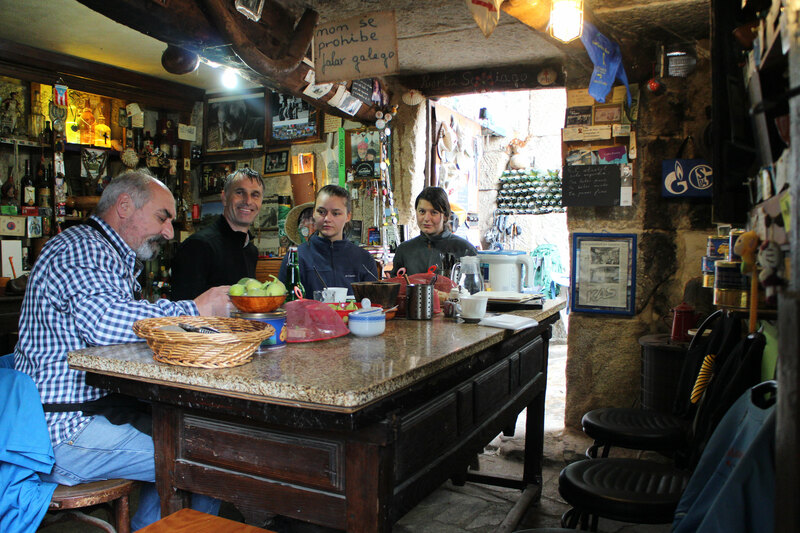 It becomes even clearer to me: it is quite demanding to be four people on the camino. Especially if like me one feels totally responsible for everyone else being happy and content. 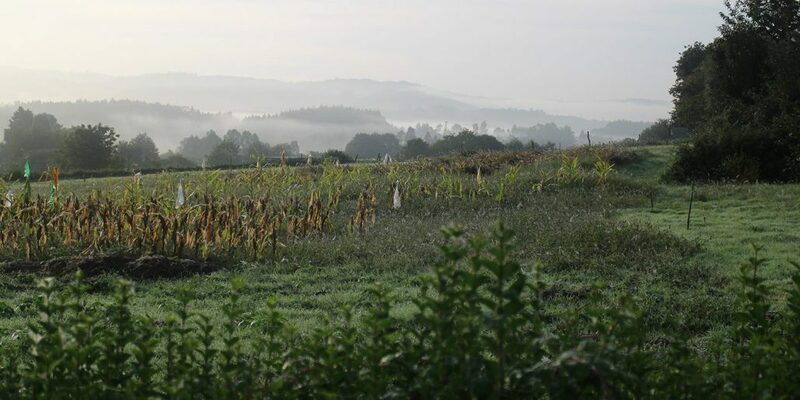 You can support and be considerate, as much as you want on the camino. Keep your problems to yourself, whatever they are … but the experience always comes from inside, from the patterns, dreams, values and challenges that we have and each bring along in our “personal life” backpack. 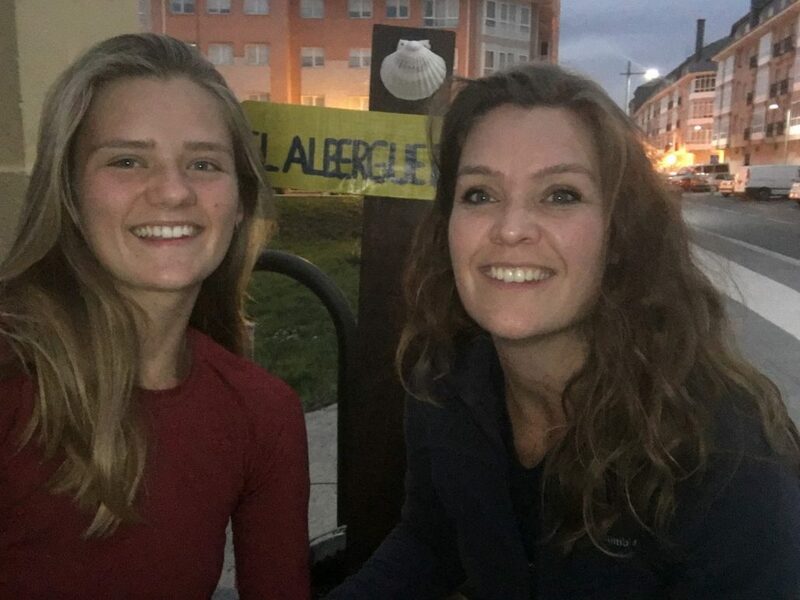 There is no mommy or daddy on the camino. There is only you, your values, and the choices you make. We reach a small house in valley bathed in sunlight, after a shady and wonderful morning trek between two paths of soft moss and eroded stones through the forest. The house looks as if it is lit up by a warm circle of light, while everything else remains in the dark. This reminds me of the perfect family, people, colleagues, emitting light while I run around in this rat race treading a never ending hamster wheel trying to get things to work together and remain together. Thinking wrongly there are families and lives where the sun always shines. 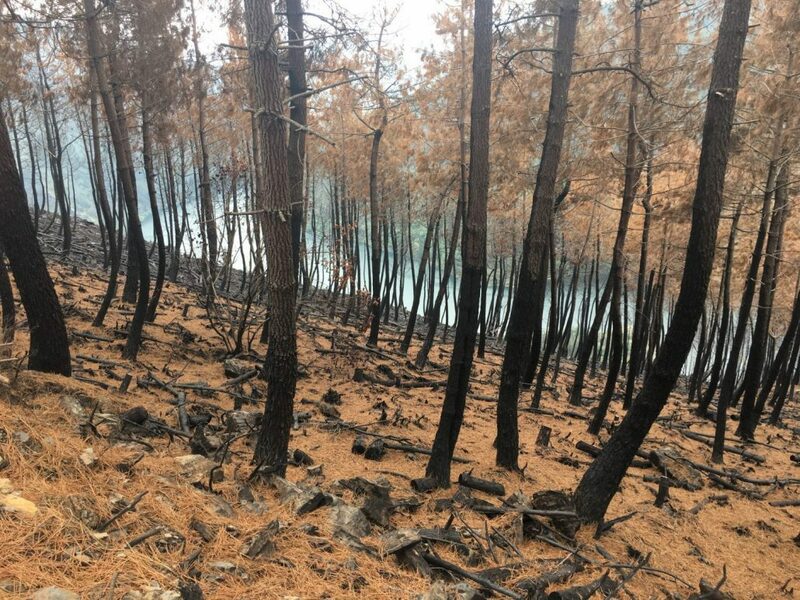 Outside the forest a fire has raged. 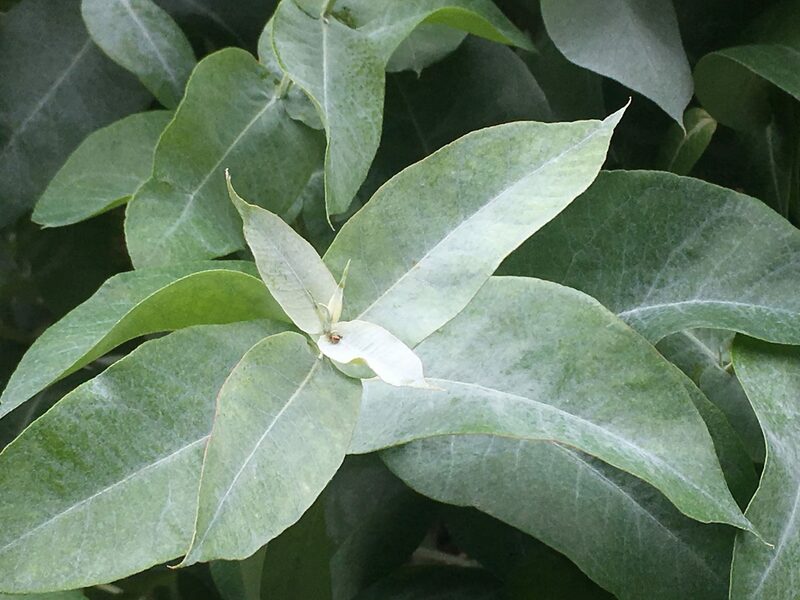 It can’t be smelled any longer, but it can still be seen. I think back to a short conversation with a former neighbor at the airport. I hadn’t given it a thought and asked “Where have you been?” and the short, too short, answer “We got divorced” still rings in my ears. Yes, something is burnt and gone. But it always comes back. New spearing green life is on its way. Different than before, slow and fragile, but on its way. On the mountain top after the valley I turn around and receive today’s Zen moment as I see the calm above the clouds. Having arrived at the café at the Oseria monastery the sun seems to be shining on someone else again. I am sitting by a table, flawed and cold. My daughter lends me her towel as I have no more clothes in my lightweight day backpack. And as fate will have it, I spill coffee on the borrowed towel. 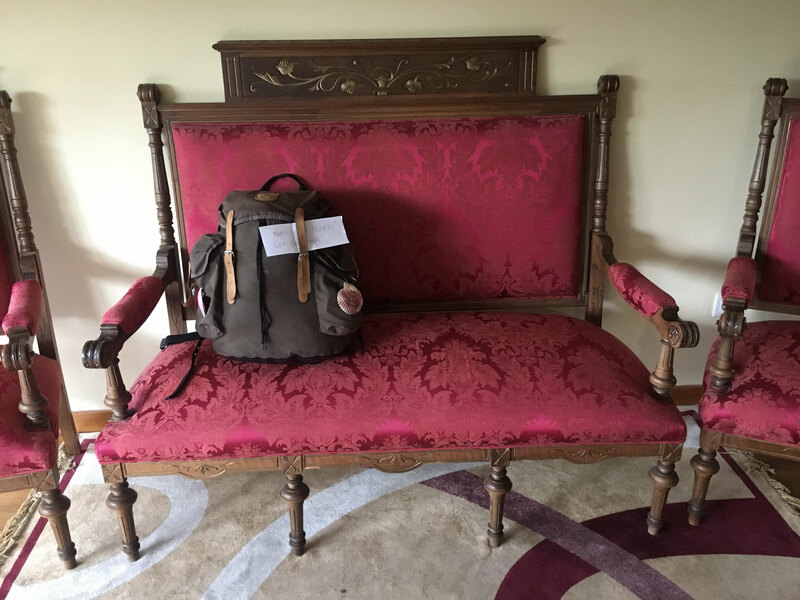 And just as I am sitting there – a complete mess, aka an embarrassing camino mom, we are surrounded by several pilgrims all dressed in proper attire, including newly washed and ironed pants and again – I compare them to myself sitting here tired and dirty. The monastery’s tower plays Ave Maria and all at once the crowd of newcomers rush to their bus parked around the corner to set their backpacks before going on a guided tour around the monastery. 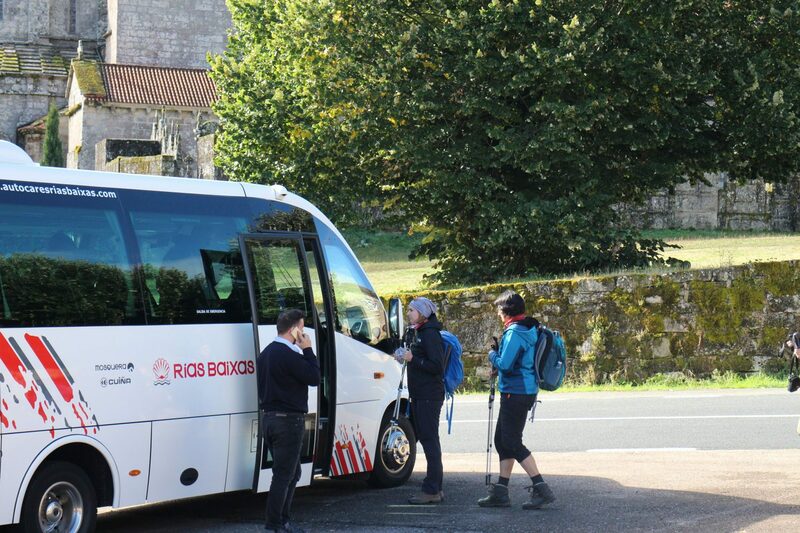 And thus I have my first meeting with Turigrinos – tourists on the camino. 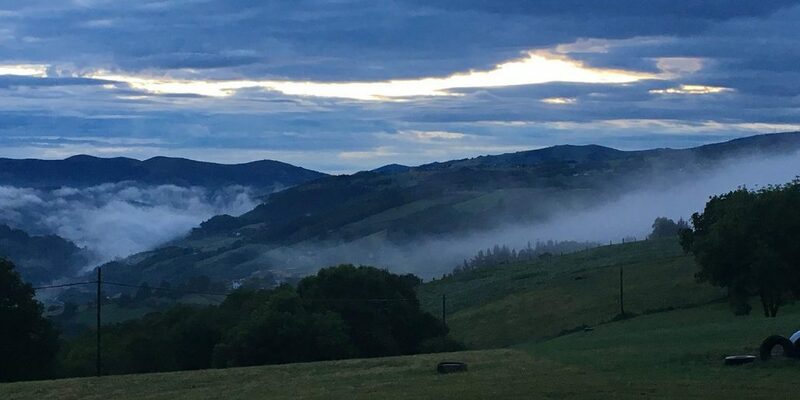 I wonder, I ponder, I look and I take in this experience and then the clearest picture emerges of human curiosity – I believe many of these tourists will come back and walk the camino. The monastery in Oseria has two sides to it. At first sight it looks closed, isolated and modest. But once you find the small gate and open it – you are met with a beautiful, open and pleasant abbey instead. This could be a reminder as not to always judge at first sight. An unbelievable beautiful day ends in the first camino walk I ever took, during which I gladly invested 3 kilometer in a taxi. We walk along the road protected by a crash barrier on one side and another road on the other side. 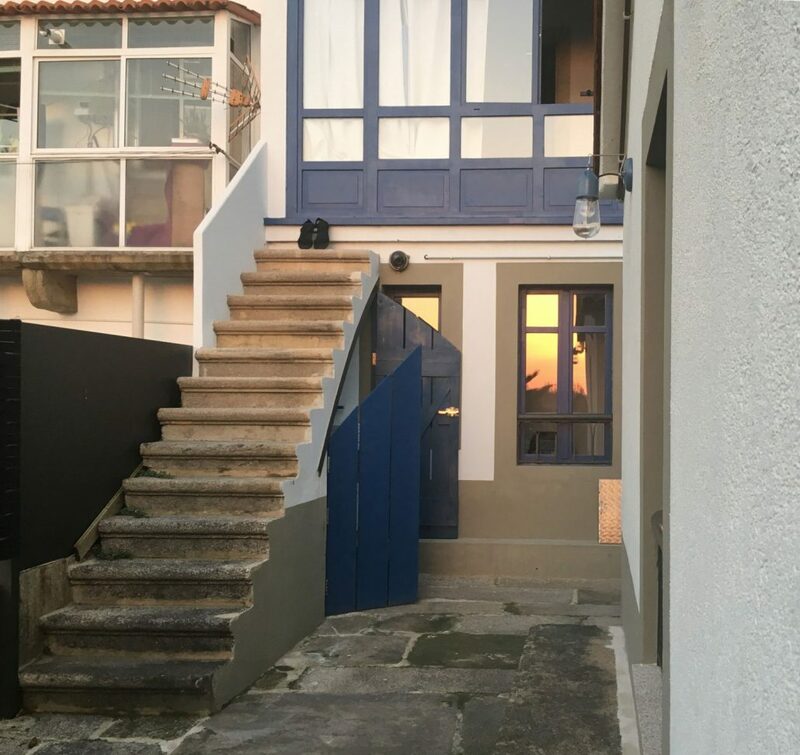 Shortly thereafter we are home again in O Castro de Dozón to spend an evening in the sun and for me… my encounter with an Italian girl with whom I speak well and who also suffers from an injury – an infected Achilles tendon and several blisters. Funny how after a day of walking we are all the same – right now the sun shines on all of us and we all take a break and sit down in it. We walked 27 kms today, including 5 in unattractive matrimonial mess. Seen in retrospect, the setting for the conflict was there from this morning. I knew it would come and I was reassured, when I saw the beautiful view squeezed in between wet grass and dark clouds. It is so clear to me that healthy loving relationships start with love to oneself. When I am not in balance I hunger for attention, understanding and affection – or just for someone to wait for me when I walk slowly. I get disappointed fast and it gets hard to satisfy me. And opposite – when I focus on loving care toward myself, the love around me comes by itself. Like my daughter who suddenly just stops and waits for me on the path. I am not alone. And even more so when I realize that it was my husband, whom I am not the best of friends with today, who suggested that my daughter wait for her mommy, because he knew, and could read me kilometers away, that this was what I needed. 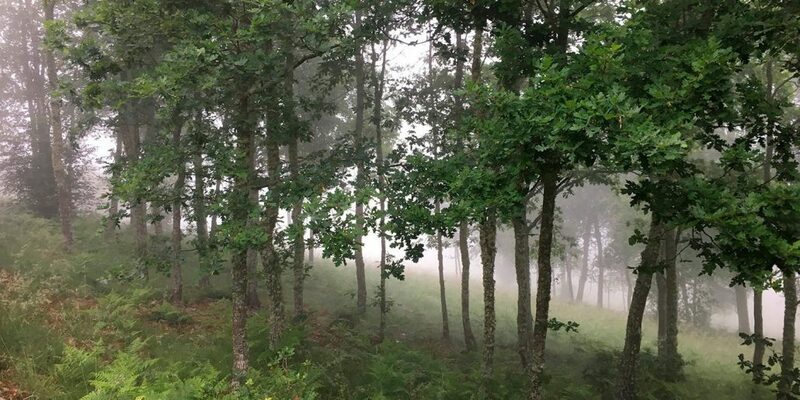 Are our conversations different on the camino? Weelll…. Not really, but maybe yes in the sense that walking and talking does make conversing easier. Disagreements and pain are still there, but with less confrontations because we are literally both going the same way. That moment where it is so important to be “right” passes somehow faster – or it is just walked away. 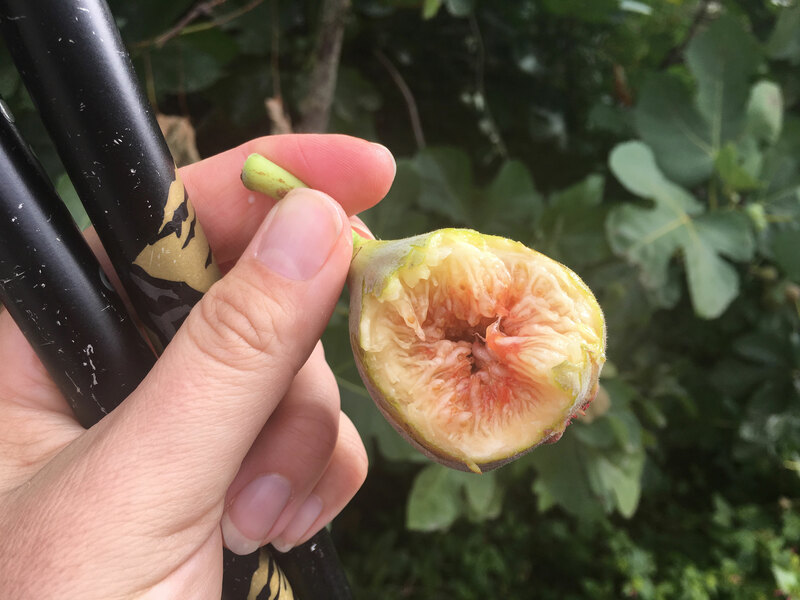 All this while we once again agree to grow old together while we eat sweet figs and admire the cactus fruits at an appropriate distance. In a part of the forest the tree trunks are covered with an ivy – this dark green plant that can climb everything if it has something to climb on. In phases on this camino I feel like I end up being this climbing plant. My inner Pippi wants to do it all myself, albeit the camino (and my husband) try to teach me how to work together and do things together. 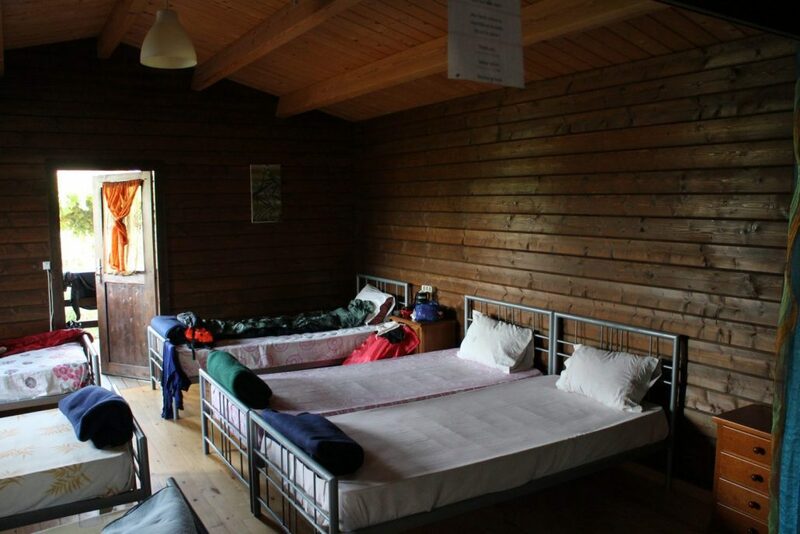 After 20 kms we reach a newly architectural designed dormitory in Galicia – A Laxe de Bendoiro. My foot hurts now. Correos has already delivered my backpack here. We could just stay, but the rest of the group still has energy and still wants to move. They don’t pressure me – however, today’s bonding and good atmosphere after the sun broke through settled it – 8 more kilometers to our next bed in Transfontao. My companions split my backpack into three and each carry their part for me to spare my foot. Our room today has clearly been brought forth to me by the camino. Torben and I are both noise sensitive. We take every impression in and feel it deep down inside. We both appreciate beauty and silence – so voilá! Here we are at Ponte Ulla in the midst of some kind of highway crossing. Beside the room costing 37 EUROs, 16-wheelers and cars rush by non-stop and the view is of not 1, not 2, but 3 gas stations. I can’t recall any other place on the camino that lacks as much charm and beauty as this. Torben lays on the bed by the window sarcastically yelling “ Listen, listen – this one’s a big one!! !” each time a new noisy vehicle passes and I laugh. The girls are on the other hand very happy with not sleeping in a common room and this is enough for them to be joyous. A true pilgrim is thankful for the luxury of a cotton bed spread. 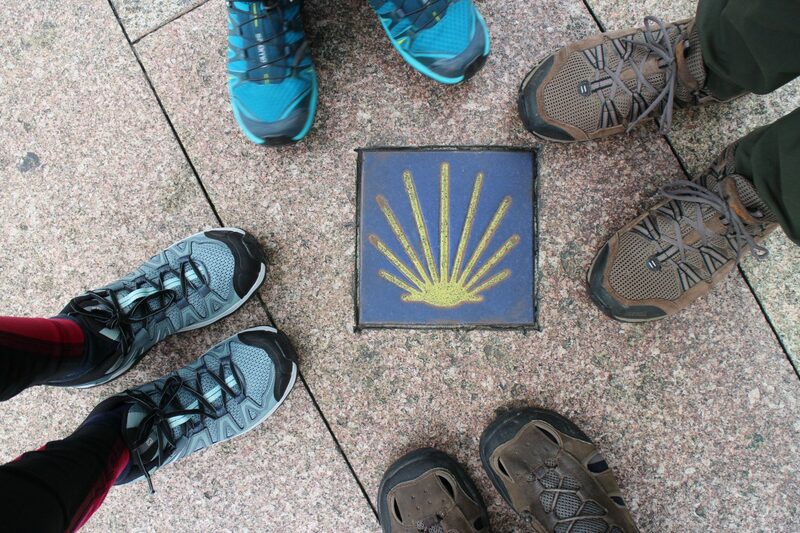 The camino is not ”just” anything. It brings many problems into focus – physical as well as mental every step of the way. Today’s quarter is an example of preferences and how our choices define us, be it this hotel room, the food or whatever. 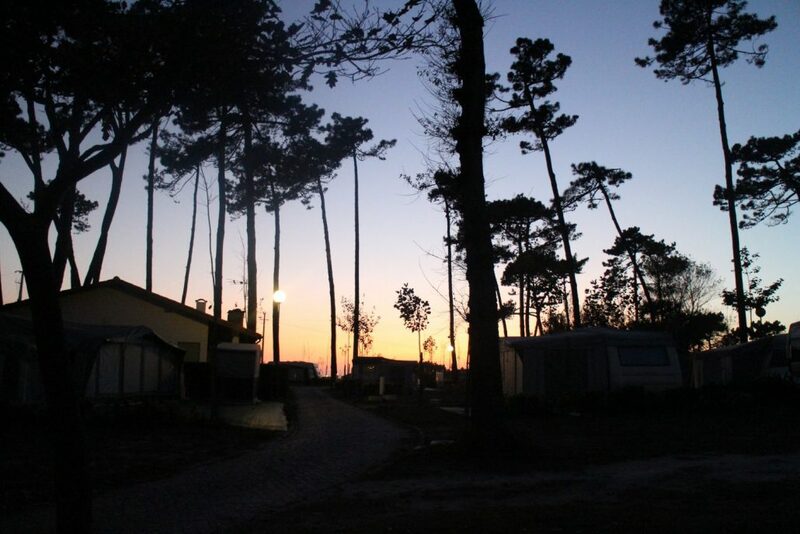 On the camino there are not always options to choose from, that cater to your taste or lifestyle – nor are there guarantees that your expectations will be met. You might be surprised or even disappointed with your morning croissant topped with sugar. Or an afternoon cup of hot chocolate as thick as porridge. But this is the croissant and the hot chocolate that the camino brought you today. 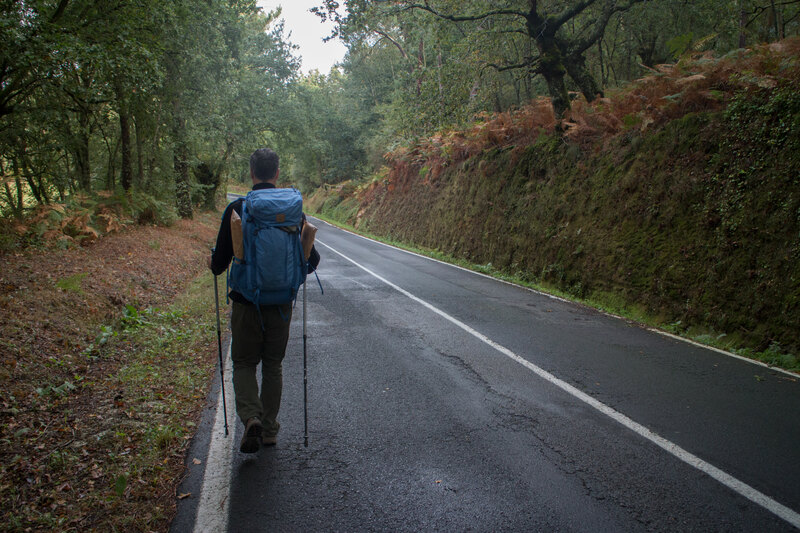 The conditions of one’s feet is of much importance on the camino, so is the weight of your backpack and if your stomach is hungry. So ok.. ok., I will be a trucker girl for the day! You’re sunshine?! Awesome!! There are other ways this camino is making me all the wiser regarding my thoughts on myself. I have for example always thought of myself as a strong woman. Now my backpack rides in a cab and I am slower and physically weaker than I am used to. 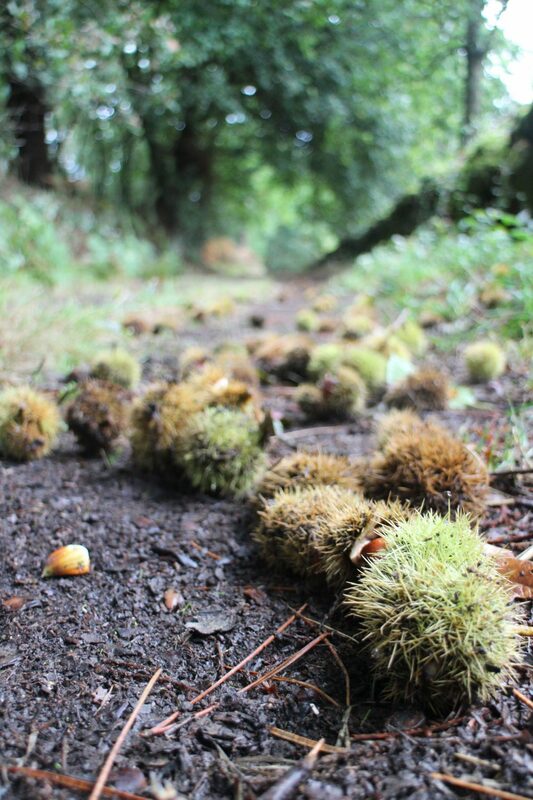 Our two daughters are strong and stride with 7 mile steps in front of me – as long as I can see them – albeit I call out “See you at the next bench” and I take my time looking for each mount of chestnuts and smelling every eucalyptus on the way. Stage upon stage I learn how important it is to focus on what I can do and what works for me. My physical state provides a glimpse into what lays ahead. More pain and several more frailties to live with, and more gratitude for the here and now. I have actually wondered why some pilgrims are concerned with the roads being asphalted on the camino routes. I only understood this when I began listening to my body and sparing it whenever I could. Ask me today and I can remember every bit of asphalted road! So far I have been frightened by the “comfy trekking life” – inspired by a conversation with a colleague about the “easy outdoors life”. Meaning outdoors life after flat sleeping pads! The camino is just as beautiful and interesting now, where I for the first time can see stretches that could be taken in a cab! Add to this a funny and compliant silver fox by my side with wrinkles you get from listening and laughing too much and easy trekking life is a good way to go. So it is completely irrelevant the kilometers I could cover before and at what speed. Because these missed kilometers are now enjoyed and appreciated fully and unhurriedly. And it is fantastic to miss out! I had booked a backpack taxi for the whole journey except the last day – today. At dawn at the motel my vanity stands naked in front of me, for reasons I can’t argue for now. I had an idea of me walking the last stage of this camino proudly with my backpack. A worn down, proud and independent pilgrim. Oh please!!!! Suddenly in the middle of my café con leche I see how trivial it is to worry about carrying my backpack myself or not! I am just as much a pilgrim with my day backpack! Luckily it is quite easy to swallow my pride and book an extra backpack taxi day: 5 euros in an envelope, name on it and happy trails, dear mochila. This morning’s breakfast of tostados are eaten while watching an incredibly thin female anchor on TV, reporting the massive rain quantities received in all of Spain except for the northern caminos. We have been spared and with this feeling of being lucky, chosen, and dry – we are off. Experience has taught me to be mentally prepared for today which will end before I am ready for it to. I am ready for the industrial areas, highways and city limits beforehand. But again I am surprised by the Camino Sanabrés! Never have I walked a camino as beautiful as this one – right up until the cathedral’s towers emerge over a wine yard on a quiet road. The long view of mountains on both sides has followed us all the way. The long view of life too. The time we first met, we were dead set on making one family out of our two, come what may. 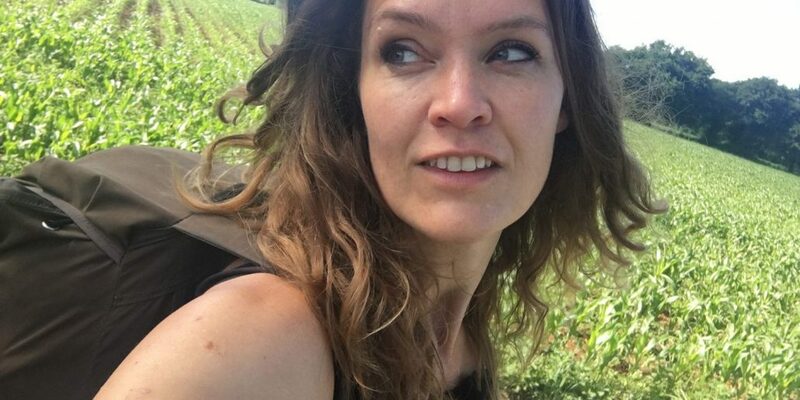 Everything the camino has changed in my life suddenly stands clear to me in the funny way that my daughter as she first sets her eyes on the cathedral shouts “Is this where we cry? !” and later at the foot of the cathedral says “WTF it’s like being in an outdoors advertisement? 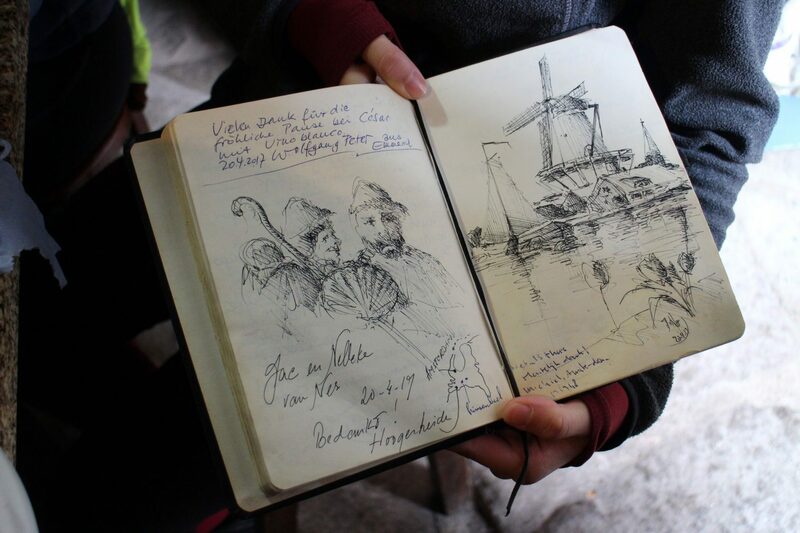 !” All through this camino it is funny and healthy to see through the eyes of our daughters. When my husband and I speak in unison, share values as well as judgement and in a very parental way think the world IS as we see it, the challenges you give us, your honesty and your way of being is just the way that you are. But no, this not when you cry. But if you do, that is OK too!